What is the language of the 144,000 chosen ones? To give you a point of reference, the Old Testament, reveals information about a type of language called “Fruit of the Lips (Isaiah 57:19).” In Aramaic-Hebrew, the said language was translated from the term: Nowb Saphah. The word Nowb comes from the primitive root word NUWB, which means “to germinate,” and “to utter and bring forth.” In an Earthy context, Nuwb Saphah literally means Nubic and via extension Nuwaubic. It is the language behind the Word in the very beginning of space, matter, and time (SMAT) that propagate or germinate existence. Nuwaubic (nuwb saphah) is the speech of YHWH (Yahuwa), whose name is HWHY or HUHI in reflection. As you know, HUHI in creation is complemented with ATUM. As Atum-Huhi (Adam-Yahuwa in the OT), the Word became flesh and dwells among us full of grace and truth (i.e., a living soul). Not to mention that HUHI is synonymous with infinity (heh/hehet) and the command of speech (hu). What is fascinating about this is that the location of the reference resonate with the number 19. As you learn in geometry, the number 19 is a self-centered (hexagonal) number and thus forms the Flower of Life pattern. It is the archetype for germination. In other words, the pattern expresses sound via interlocking geometric tones and vibrations that holds into place transient thought (I AM). 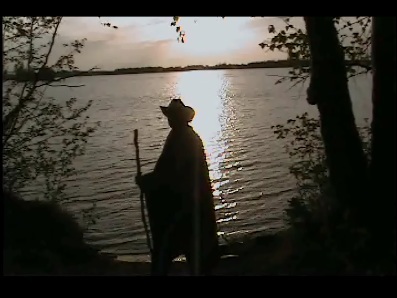 Last edited by Pa Neter Ra; at 01:49 PM..
Peace in the Lamb for it is Truly Wonderful! What is the force behind the Hennu? 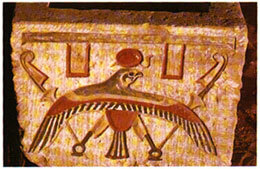 The Hennu is the barque of Sokar, the resurrected Asar, the manifestation of the hawk/falcon. As taught in the Sacred Records of Neter Aaferti Atum-Re (The Black Book) you shall know the truth and it will make you free of lies and untruths that killed your soul. The Bik, "hawk" must be risen from the mental dead. 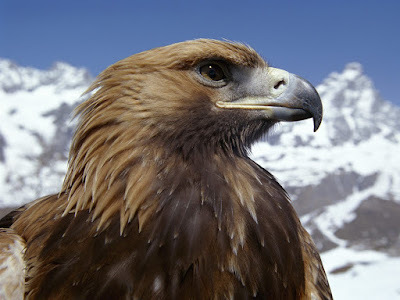 You must now begin to look through the eye of the Ba-uz "falcon", and go out and consume the mentally dead as the Ner "vulture" to bring them back to real life (In Full Life). You have been dead for too long (civiliter mortuus), laying in an unlit grave, but now I reach out my hand with the grip as the strongest of Akiraat "lions" (P. 60). Within the circumference of the cube of Matatrun above, I have inscribed the symbol HUWA, which is the symbol for Love. 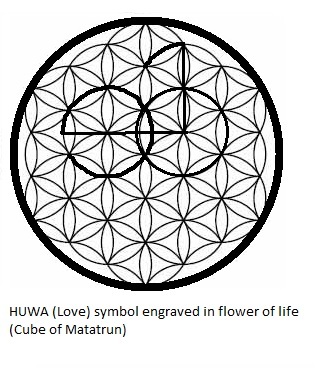 The difference with the inscribed HUWA in the cube of Matatrun and the HUWA symbol inscribed by the Master Teacher Ra Atum is that the one inscribed in the cube centers about (shares) the Vesica Piscis, the womb of sacred geometry and supreme mathematics. The top half of the vesica piscis represents the higher-self (Blue-Green Light, positive); whereas the bottom half is symbolic of the lower-self (Amber Light, negative). Yet, man must learn to love instead of hate to render these divine principles, Love, Truth, Peace, Freedom, Justice, and Beauty, operational in a sphere that is ever inspiring. I speak to you from the houses of Leo and Aries. I hold the Black Book, Sacred Records of Atum-Re (Order of the Black Eagle) and the Gold Book, Sacred Records of Tama-Re (Order of the Golden Eagle) together in common radius around the vesica piscis. You are part of the ALL (El Kuluwm). 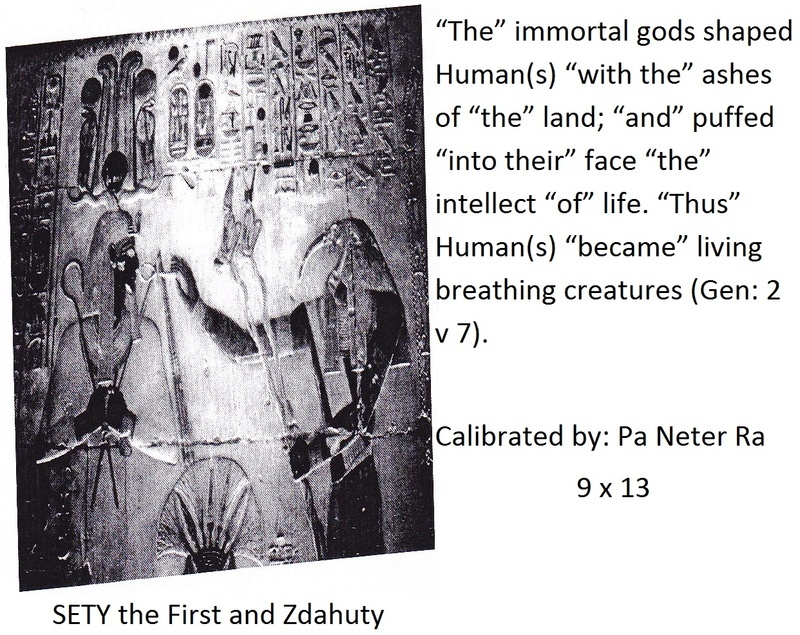 Last edited by Pa Neter Ra; at 04:19 PM..
What is the purpose of the feathered serpents here on earth? 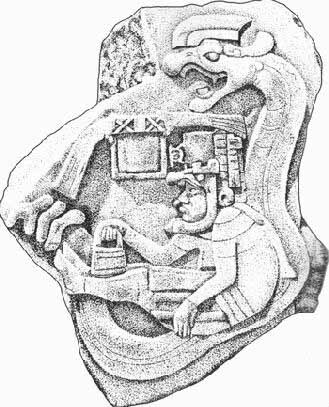 The Holy Tablets, tablet 3:62, The Scientists, explains that the Naga (Nagas) are a benevolent race of serpents (reptilians) from a binary star system known as Procyon (Canis Minor). The Naga are extremely kind towards humans. From time to time the Naga descend into the Earth plane (Naasuwt) to assist and instruct humans in matters of peace, justice, fertility, health, spiritual enlightenment, and wealth. Through the resonate structure of DNA, the Naga can enter and communicate with the host to carry out the said matters. DNA is the emotional intelligence resonate at the wavelength of blue-green light. This wave signature governs the Heart. By Reason of this, truth shall be established in the midst of the waters. I calculate this to be DIVINE LOVE = 117 = 13 x 9. Last edited by Pa Neter Ra; at 05:09 PM..
You may recall that the Earth's ionospheric fundamental frequency or standing wave is 7.8 cycles per second (cps). Several octaves above the Earth's ionosphic (ETHAR) fundamental is 117 cps. As I have taught over the years that the number 117 is the value for the words NUWAUPU, DIVINE LOVE, and the energy formula MC^2 (13 x 9 = 117). First, NUWAUPU is the science of sound right reason (actual facts). The testing of knowledge (evidence, experience, and reason) is important in attaining the trinity of certainty i.e. right knowledge, right wisdom, and right overstanding. Second, DIVINE LOVE or 'ishq is the Vine ('ashiqah). The word 'ishq is not in the Quran, but the dynamics of divine love ('ishq or 'ashug) take shape in the helical or braiding pattern of vines and the DNA molecule. Vines take root in the EARTH. DNA takes root in the HEART. Divine Love takes root in the ETHAR. As you can see, the words Earth, Heart, and Ethar are precise permutations and are media for braiding energy (golden spiral), which is a type of emotional intelligence. And finally, MC^2 is the idea to equate energy and mass while using the speed of light as the catalyst. As a catalytic agent, light speed is the conduit to dissolve the standing wave (inertia) of mass for it to only recreate (solute) in another space and time. 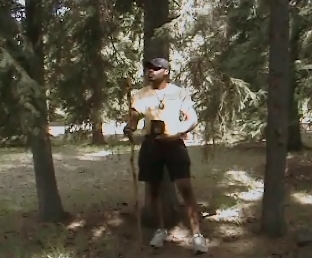 This particular technology resonates with the ancient science known in ancient Ta-Mery as WABAN (wbn) or WABANOO (wbnw). In this day and time, the science is known as Nuwau-Bu or NUWAUPU (13 x 9). The term waban means "to rise, to radiate" or simply "to rise in radiance." 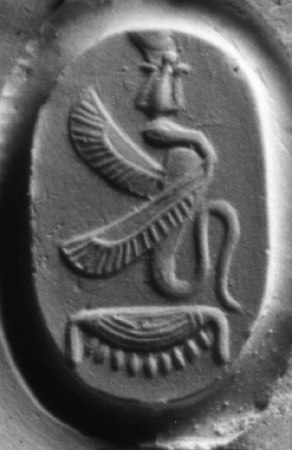 The symbol is the bennu bird or the winged serpent-sun disk (sun of justice) mentioned in the book of Malachi. Your Holy Bible (el bib yloh or El Bab Eloh) contains 66 books, which the old testament has 39 books and the new testament has 27 books. The common denominator is three and thus the book simplifies arithmetically to 13 and 9. This bibilcal code echoes the arithmetical makeup of the universe and the differential spin of the Sun. Recall that the Sun spins relatively faster at its equator (27 days) than at its poles (39 days). Moreover, the code echoes the mathematical nature of the Nubian Number: Nine to the Ninth Power of Nine, the Nubian Mind. Last edited by Pa Neter Ra; at 03:12 PM..
Where else can one discover the workings of the Golden Ratio? The golden ratio is the inter-galactic and intra-galactic algorithm through and through the Great Existence. 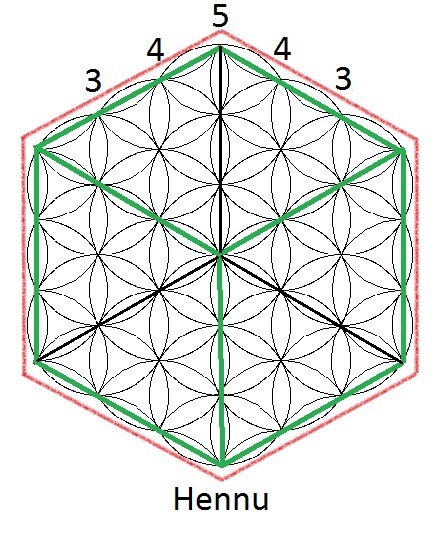 Mathematically, the golden ratio is the ideal means to squeeze or implant coded awareness to carry out life processes. Under ideal conditions, compressed/embedded sentience blooms in accordance with the arithmetical sequence 0,1,1,2,3,5,8,13,21,34,55,89,144 ad infinitum. The thirteenth number in the “Fibonacci sequence” is 144, which has a digit sum of nine (1+4+4 = 9). Therefore, the numerals 9 and 13 are phase locked in the above arithmetical sequence. The number 144 is gematria for Light. On 13 September 2007, one hundred and forty and four (144) nations adopted the Declaration on the Rights of Indigenous Peoples (UNDRIP). As one can see, the 144 nations sent an earthy light message throughout the world mathematically. The reckoning of the adoption of UNDRIP was in accord with the call of the universe. September is the 9th month in the Gregorian reckoning system, which happened to be on the 13th day. The call for Great Peace came at the turn of the century, when Neter: Nebu Atun-Re had opened the equation nine to the ninth power of nine (Nubian Mind) in AD 1999 and revealed it to the world in AD 2000 to inform its inhabitants of what has been done and what is to be done. He who has an ear let him hear what an angel says! Last edited by Pa Neter Ra; at 03:10 PM.. The word Allah is related to the Aramaic-Hebrew word ‘alah (He, Lamed, Aiyn), pronounced Aw-Law. The Aiyn is silent and thus the Aiyn Principal. Per strong concordance number 5927, ‘alah means “to ascend,” “to spring up,” “to arise,” et cetera. Having knowledge of self, informs one that ALLAH is Arm, Leg, Leg, Arm, Head i.e., God manifest. Considering this, Allah in supreme mathematics, taken in the milieu of the 99 plus one Best of Names, Allah expresses the Golden mean ratio. As you have learnt ALLAH is God manifest. This is the cipher in the “Fibonacci sequence.” Next, al-Rahman is unity or the number one, followed by al-Rahim, which also signifies unity or the number one and so on to the 99th attribute, al-Sabuwr. Recall that the “Fibonacci sequence” is described as: 0, 1, 1, 2, 3, 5, 8, 13, 21, 34, 55, 89, 144 and so on. Allah = 0, Rahman = 1, Rahim = 1, and so on. As you know, the Arabic words Rahman and Rahim stem from the same tri-consonantal root RHM, which means womb, matrix, godsend, et cetera. The Aramaic-Hebrew word for Matrix or Womb is Racham (strong # 7358). Through the womb human beings and all sentient things are created equal. What do you mean by created equal? 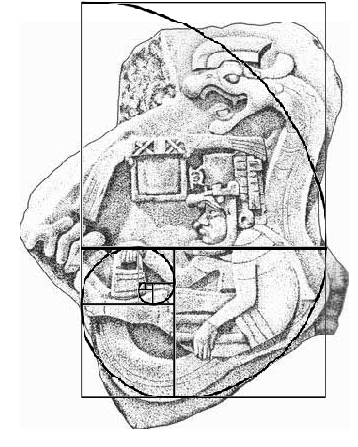 The Golden Mean Ratio is the algorithm by which all life through and through the Great Existence is shaped and molded into beauty (existence). For example, the human DNA molecule measures 34 angstroms long by 21 angstroms wide for each full cycle of its double helix spiral. Hence, the pitch 34:21 = 1.619 or its inverse pitch point 617. Beauty is at the heart of worldly perception and it articulates the handiwork of the Creator. Just having an inkling of this mathematical fact (1.6180315) allows one to plug into the dynamic side of reality i.e. turning inside-out and outside-in. 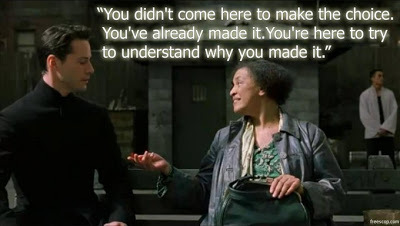 Life is resonate with processes within processes and so existence has a uncircuitous connection with the Creator and Creation here and beyond. The path of life is serpentine, but the Creator has lain an ideal path for each who has a living mind. Last edited by Pa Neter Ra; at 04:31 PM..
Quest-ion: You mentioned the pitch of DNA being 34:21 and how this pitch relates to the golden mean ratio. What else can we learn about the DNA molecule in the context of PHI? When I speak of “pitch,” I speak of the “word” in the milieu of music. Pitch, as you may recall, is a perceptual property of sounds that allows their ordering on a frequency-related scale. Human DNA molecule, for example, is the standard from which inner visions are spun into outer realities (building blocks of life). Recall the nitrogenous bases of DNA are adenine, thymine, guanine, and cytosine? Well, these bases pair into two groups called purine group and pyrimidine group. Adenine and guanine belong to the purine group; whereas cytosine and thymine belong to the pyrimidine group. Purine bonds with pyrimidine to form nucleic bases bound to each other by hydrogen bonds. For instance, guanine-cytosine (G-C) and adenine-thymine (A-T) pair in such a manner to form two hydrogen bonds for A-T nitrogenous base pair and three hydrogen bonds for G-C nitrogenous base pair. As one can see, the purine-pyrimidine assemblage pitch (frequency) is related to the initial formation of the “Fibonacci” sequence. The pitch 2:3 is point 666 ad infinitum and its inverse pitch is 3:2. In music, this is called a “Perfect Fifth (3:2).” Recall that the fifth is the third sound of the series of harmonics, the first being the fundamental (1:1) and the second its octave (2:1). Furthermore, in molecular biology and biochemistry, directionality (DNA Transcription) is the end to end chemical azimuth of a single strand of biopolymers called nucleic acids. The relative azimuth of the strands is either upstream (5-prime end) or downstream (3-prime end). As one can see, directionality of DNA transcription carries the pitch 3:5, which is another golden mean ratio disclosure. What is molecular DNA disclosing to us? Spin inner visions into outer truths (realities). Does this explains the helix shape of DNA? In 1952, a woman named Rosalind Franklin uncovered the helical structure of DNA using X-Radiation (X-Ray) diffraction. As a result of Franklin's studies, the magnetic-crystalline structure of DNA produced an appearance of the "letter X." Based on this observation, an accurate model of the DNA helix was subsequently developed. The directionality of DNA appears to illustrate the letter X phenomenon. For instance, the end-to-end upstream and downstream of phosphate-deoxyribose coding strands are paired on either side as 5’3’ or 3’5’. Using the commutative law and properties of equality (e.g., reflexive), one can see that 5’3’ = 3’5’ produces the letter X. Through extension, the nine-multiplication table marks the letter X between the products 9 x 5 = 45 and 9 x 6 = 54. The said law and properties of mathematics apply here as well (45 = 54). Below is my depiction of the mathematical caduceus in the context of the number NINE. 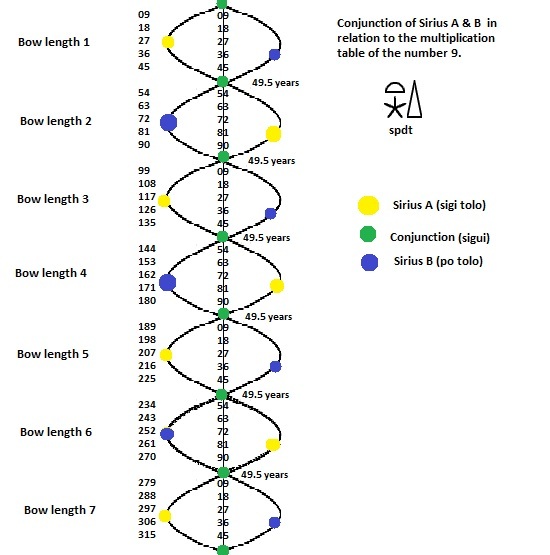 Last edited by Pa Neter Ra; at 11:52 PM..
Are you saying DNA is mathematical? Mathematics is the science of quantity (quantum) expressed in the mind of magnitude and multitude. The command of the Elohim “be fruitful and multiply” attest to the science of mathematics beyond the comprehension of mortals. Essentially, the science of quantity can be viewed as either arithmetical (discrete) or geometrical (continuous). The mathematical caduceus above depicts the mudra of Buddhist King Ashoka. In ancient Sumer, it depicts NINGISHZIDA, “lord of the good tree.” Today, the caduceus is used as a symbol of COMMERCE. Hermes Trismegistus is the patron deity of commerce. However, I utilize the mathematical caduceus as a mudra of the Great Peace and I have mathematically raised it in the Western wilderness. The book of John 3:14 states how Moses had lifted up the serpent in the wilderness as an inevitable sign of "lifting up (wbn)" the Son of Man. This demonstrates an act of not changing the Law, but the fulfillment of it. This chapter resonates with the mathematical constant PI (3.14), which is the universal Law of the ratio of a circle's circumference to its diameter. The circle is one of the four conic sections. In mathematics, a conic section is created from the intersection of the surface of a cone with a plane. The intersection of such plane generates the following conics: (a) Ellipse, (b) Parabola, (c) Hyperbola, and (d) Circle. The latter is a special type of ellipse whose foci (focal points) have taken on superposition at the center. As you may know, the length from the center of a circle or sphere to ALL points on its circumference has the same magnitude. The act of centering is like the art of concentration. Refer to the Holy Tablets chapter 7 (The Living Soul), tablet 13. The light of the body is the eye. If it is brought into focus, then the entire body shall be full of light. As one learn from the Holy Tablets, the mind does not think of two things at once because mental waves oscillate with light speed between ideas. I say again, the light of the body is the eye and if it is brought into focus, then the entire body shall be full of light. Remember no man can serve two Masters: God and Mammon. The choice is yours.